Source: Chile, Italy and the United States. Handling Tips: Keep cold, 32° F; mist lightly. 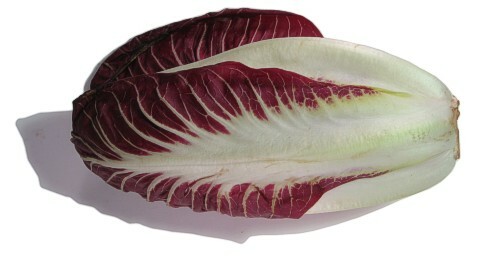 General Information: Radicchio di Treviso comes from the Italian region of Veneto. Its elongated leaves are similar to romaine lettuce or overgrown Belgian endive and differentiate this radicchio from the more common Verona or round-head radicchio. Radicchio is a mildly bitter tasting leafy vegetable. It is actually Italian Chicory. This vegetable is very popular in Italy and has gained in popularity in the United States in the last few years. It is eaten raw with just a bit of olive oil and salt, as well as mixed into a variety of salads. You may also see it on menus grilled or roasted or combined into other dishes such as risotto. Treviso is a milder form of radicchio and is prized in salads and side dishes. When it comes to adaptability, many restaurateurs in Italy feature grilled Treviso on their menus and serve it as an alternative to steak! Nutritional: A 1 cup (shredded) serving of Radicchio has 9.2 calories. It is high in magnesium, potassium, and has 10.8 I.U. of vitamin A. It is 70% carbohydrate with just a small amount of protein and just a trace of fat. Excellent source of vitamins A and C.
Applications: Treviso is well suited for grilling or as a garnish. Because of its adaptable shape and mild flavor Treviso is truly the Italian vegetable that cooks! Cut in half through the core, brush lightly with olive oil and grill until tender for a tasty side dish. Quarter the Treviso and bake with olive oil and Parmesan cheese and you have a delicious gratin. As with all radicchio you can control the intensity of its flavor by soaking the leaves before you use them. History: Radicchio has been around for quite some time: Pliny mentions the marvelous red-lined lettuces of the Veneto region in his Naturalis Historia, noting that in addition to being tasty they're good for insomnia and purifying the blood; he also says it was the Egyptians who bred radicchio from its more wild ancestor, chicory. In the Middle Ages it was especially popular among monks, who welcomed anything that would add zest and flavor to the simple, predominately vegetarian diets proscribed by their orders. Not that the plant was limited to monastic kitchens; it also figured prominently on the tables of nobles, both cooked and raw: In 1537 Pietro Aretino advised a friend who had a garden to plant it, saying he much preferred it to "aroma-free lettuce and endive." While tasty, this radicchio isn't the radicchio rosso we know today: the modern radicchio with its rich wine-red white-ribbed leaves was developed in the 1860s by Francesco Van Den Borre, a Belgian agronomist who applied the techniques used to whiten Belgian endive to the plants grown around Treviso. The process, which is called imbianchimento, is quite involved: the plants are harvested in late fall, their outer leaves are timmed and discarded, they're packed into wire mesh baskets, and they're stood for several days in darkened sheds with their roots bathed in steadily circulating springwater that emerges from the ground at a temperature of about 15 C (60F). As they bathe the leaves of the hearts of the radicchio plants take on the pronounced wine-red color that distinguishes them (the deeper the red the more pleasingly bitter the plant). At this point the farmer unties the bunches, strips away the outer leaves and, trims the root (the tender part that's just below ground level is tasty), and sends the radicchio to the market.